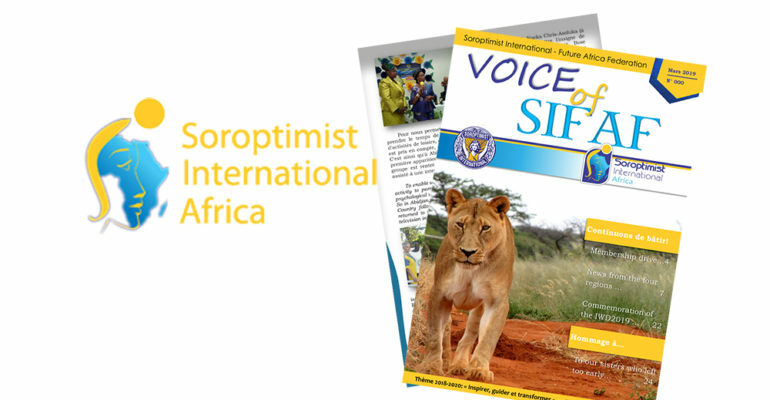 You may have heard little news about the Soroptimist International Future African Federation (SIFAF) following the report on the 4th biennial SIFAF conference which was held from 20-22 April 2018 in Marrakech. 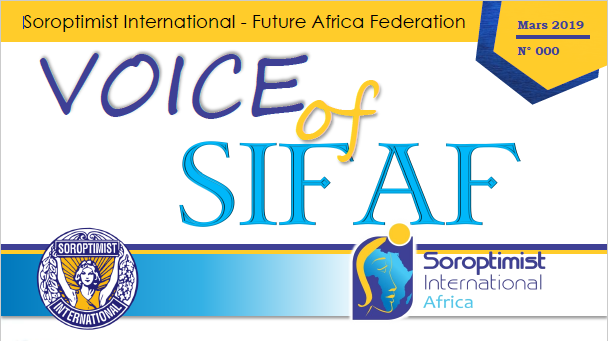 But make no mistake, many Soroptimists have been working very hard during the past year towards the moment of chartership so that SIFAF may become SIAF, the Soroptimist International African Federation in 2020. A major milestone in this process was the 1st issue of the SIFAF electronic newsletter: Voice of SIFAF, which came out in March and which we encourage you to read. You can download it here. It is full of exciting news and developments. Our sisters need our full support and encouragement at this stage. Constance Mutunhu, Extension & Membership Director, communicates with the country ambassadors in the four regions to gather data on the membership so that the database will complete and encourages clubs to each recruit 3 new members in order to have the required 2000 members. There are 1880 members at present. Constance also works together with the regional Vice Presidents (VPs) in the hope of chartering at least one new club in each region. The theme of the 2018-2020 SIFAF biennium is “Inspire, lead, and transform” and as Nivo Rakotoarisoa, SIFAF Communications Director 2018-2020, rightly says, their magazine, Voice of SIFAF, is an excellent channel through which to put the theme into practice. It includes inspiring stories about each region’s projects for empowering women and girls and a platform for blogs and articles about female leadership. Nivo is also rightly proud of the new SIFAF website www.siafrica.org. When opened, president Mary Muia starts a welcoming speech to the visitor explaining what our organisation is about and inviting all professional women to join Soroptimist International. You can easily find out which clubs there are in each African country, no less than 112 clubs in Africa! 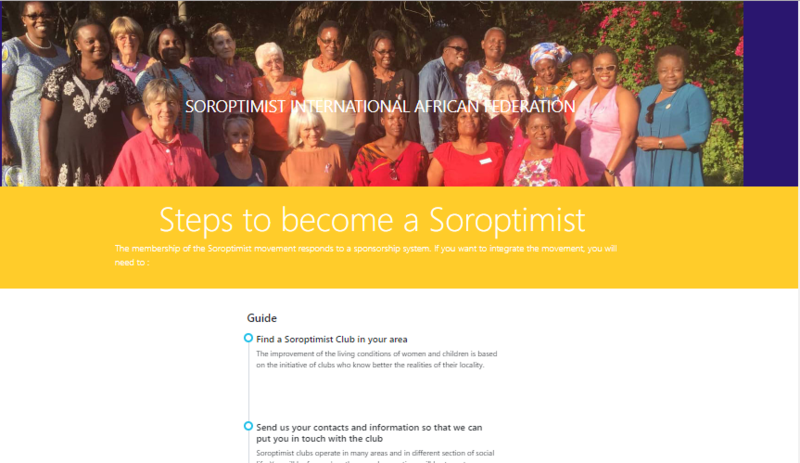 The site is geared towards attracting new members; it even has a menu item “Steps to become a Soroptimist”. There is a members’ area that will be used for spreading information to the membership, showcasing projects, and billing clubs based on number of members. Nivo realises the crucial role communications play in making the African Federation a success. Another development is the extra emphasis given to the role of country ambassador. Country ambassadors report to the regional VP and vice versa, the regional VP can reach the entire membership through the ambassadors. This ensures coherence in the widespread organisation. Skype and WhatsApp groups are also used by the African Soroptimists to keep in touch and work towards chartership. Apart from having enough members and getting communications sorted out, there are many other goals that must be reached before the new federation can be chartered. SI President Mariet Verhoef-Cohen has made supporting and guiding the creation of the SI African Federation one of her focal points from the start of her term in July 2017. SI President Mariet says “SI Head Quarters is regularly in touch with Task Force 4. Under the guidance of chair Mary Muia, they have been working terribly hard. They are almost there, but there is still a lot to do, apart from getting to the magic number of 2,000 members. In 2017, we created a timeline including complicated matters such as putting in place policies and protocols as other Federations have done in relation to ballots, financial transparency, actions before and during general board meetings, and code of conduct for all members, as well as drafting proposed Federation constitution and/or Articles of Association and Bye‑Laws, and more. I am so proud of the SIFAF task force for all the hard work they have done to keep up with our timeline. The timeline states when to submit all the necessary application papers for the SI Board Meeting in Kuala Lumpur in July 2019. I would especially like to thank SIGBI member Margaret Oldroyd, who has supported the SIFAF Task Forces with her thorough knowledge, constant follow-up and advice for many years and of course the SI Directors from SIGBI and SIE, Ann Hodgson and Anna Wszelaczyńska. 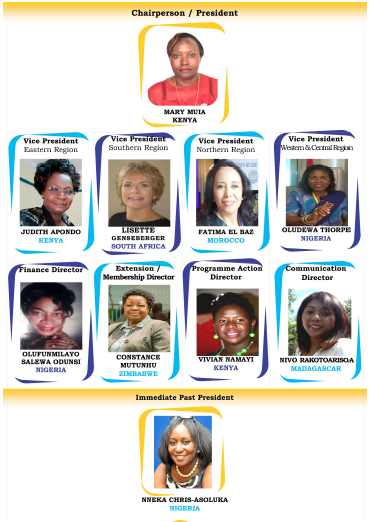 In conclusion, all hands are joined for African Soroptimists to achieve their dream and celebrate the birthing of the SI Africa Federation-SIAF at their next biennial conference 16-19 April 2020 in Ivory Coast. Welcome all Soroptimists!